Eating a balanced, plant-based diet is not only the best choice for your health and the planet--these foods are also essential for your mental and emotional well-being. These gourmet recipes, both savory and sweet, are designed for an on-the-go lifestyle and will both nourish and delight you. 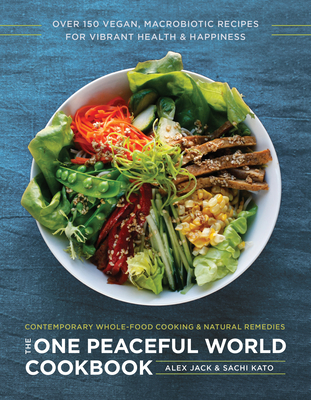 The One Peaceful World Cookbook empowers you with the tools and recipes you need on your path to optimal health and well-being. Alex Jack, a macrobiotic teacher and counselor, is executive director of Kushi Institute and founder and president of Amberwaves, a grassroots network devoted to promoting whole grains and other natural foods. He is the co-author with Aveline Kushi of Aveline Kushi's Complete Guide to Macrobiotic Cooking (Time-Warner, 1985), the world's bestselling macrobiotic cookbook. He has also written many popular books with educator Michio Kushi, including The Cancer Prevention Diet (St. Martin's, 1983, 1991, 2009), (St. Martin's, 1985), The Macrobiotic Path to Total Health (Ballantine, 2003), and The Book of Macrobiotics (Square One, 2013). He also wrote The Mozart Effect: Tapping the Power of Music to Heal the Body, Strengthen the Mind, and Unlock the Creative Spirit for Don Campbell (Avon, 1997). Based in the Berkshires, he is a senior teacher and counselor at Kushi Institute and serves on the guest faculty of the Kushi Institute of Europe and Rosas Dance Company in Brussels. Sachi Kato is an accomplished macrobiotic chef, cooking teacher, and dietary counselor. She is also a photographer specializing in food, portraiture, and still life. With a focus on fine art photography and inspired by Pictorialism, her work melds a soft and expressive atmosphere with painterly sentiments. She uses a subtle color palette, which stems from a deep appreciation of her native Japanese arts and culture. Her most recent exhibit Tranquility was presented at the Bolivar Cafe and Gallery in Santa Monica. Sachi serves as a head chef and cooking teacher at Kushi Institute. She also teaches in New York City, San Francisco, and other major cities, as well as in Japan and Europe.